Last week's biggest smartphone patent news was a first Office action by the United States and Trademark Office (USPTO) tentatively rejecting all 20 claims of the "[Steve] Jobs patent" (as Apple's own lawyers wanted to call U.S. Patent No. 7,479,949 on touchscreen heuristics at a trial in Judge Posner's court). Samsung alerted the ITC to this preliminary result of an ex parte reexamination triggered by an anonymous request because an initial determination by an ITC judge, which the ITC staff supports, held this patent to be infringed by Samsung and would, if affirmed by the trade agency's top decision-makers, result in a U.S. import ban. "Contrary to Mr. Huang's suggestion, this non-final office action has little or no relevance to the validity of the '949 patent, currently asserted before this Commission in the above-captioned Investigation, because of the preliminary nature of this office action and the different evidentiary standard applicable to reexaminations." The letter then elaborates on the two prongs of Apple's argument: the preliminary nature and the question of the evidentiary standard. The fact that Apple felt compelled to write to the ITC shows that there is concern about the impact the first Office action could have on the ongoing review of the initial determination. Apple's letter points to statistics and case law, and all of that is correct per se -- but it's only one part of the story. If some claims are affirmed and some are ultimately rejected, the broadest ones will probably fall. Working around the narrower ones will be much easier and in many cases can be done in ways that users don't even notice. If you look at section 10.b of the USPTO statistics, you can see that in a reexamination of this kind, claim charges occur in almost two thirds of all cases. This means the patentee has to modify the claims (typically in a way that narrows them, even if only in the sense of a clarification) in order to salvage them. But the ITC ruling can only apply to the claims as they stand today. I know that some people commented on this right away with claims that it's easy to get a reexamination started and then pretty normal for all claims to be rejected in the first Office action, or maybe even a second Office action. My own blog post on the first Office action contained a whole paragraph summarizing that perspective -- and I have previously warned people against overrating the significance of first Office actions, but I would never recommend anyone to underestimate them. The truth is that it's a very early stage of the process and a lot of things can happen. But Samsung and/or whoever else may have triggered that ex parte reexamination have taken two hurdles. The first hurdle is that the USPTO doesn't reexamine every patent only because someone requests it. In fact, a reexamination request against this particular patent, likely brought by Nokia (which later settle with Apple), failed in 2010. The standard for an ex parte (meaning that a party requesting it can be anonymous and in any event doesn't get to participate as much as in an inter partes proceeding) reexamination is that it must raise a substantial new question for patentability. (The standard is higher for inter partes reexaminations as per the America Invents Act.) After meeting that hurdle, the USPTO's Central Reexamination Division takes a close look. That close look can have different outcomes. There are examiners who simply reject all claims at that stage in order to force a patentee to defend the patent with the best arguments. But it's also possible that an Action Closing Prosecution is issued right away and affirms all claims. And it's not unusual at all for a first Office action to have a mixed outcome: some claims affirmed, some rejected. Here, the preliminary outcome is the worst one it could have been for this patent. I'm not against Apple, but that doesn't mean that I always agree with them, and sometimes I'm skeptical of things Apple says or does, which includes the validity of this patent. Some of the Apple fans among my readers told me they were quite disappointed when I recently expressed my skepticism of the sustainability of Apple's profits in light of competition from Android. Just today I read that Google's executive chairman Eric Schmidt (with whom I disagree far more frequently than with Apple) claims that Android, with 1.3 million devices activated every day, is clearly winning the platform war against Apple, and I can't see how Apple can fend off this threat without enforcing intellectual property rights to ensure at least some degree of differentiation from Android. The anti-cloning part of the HTC deal shows that Apple values differentiation, though it's possible that the same terms in an Apple-Samsung deal would not be sufficient to properly protect Apple (given Samsung's much greater market share and resources). 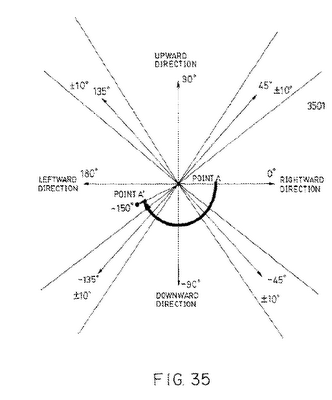 I already showed that image in my report on the anonymous reexamination requests that got the "Steve Jobs" touchscreen heuristics patent (as well as, on different grounds, the rubber-banding patent) in trouble. I also quoted a couple of paragraphs from Wakai and concluded, back in the spring, that "the Wakai prior art reference appears to render the '949 patent obvious, if not non-novel". Now that Figure 35 is also shown in the first Office action that Apple now wants the ITC to attach little or (ideally from Apple's perspective) no weight to. Apple's other argument in the letter to the ITC is, as I mentioned above, the question of the legal standard. Apple reminds the ITC of the fact that USPTO reexaminations use a preponderance standard (meaning "more likely than not") while the ITC, like U.S. federal courts, considers patents invalid only if there's clear and convincing evidence (meaning much more than just a 50% chance) of invalidity. And Apple cites ITC decisions that were based on this difference. However, the formal legal standard is one question and the overall political and psychological situation is another. The ITC has quasi-judicial competencies but it's not as independent as a court. It's a government agency. Apple wants a U.S. government agency to order an import ban (which can be worked around, but it can still be perceived by foreigners as protectionism) against Samsung, the largest company from a country that is a geopolitically important ally of the United States. In light of this, the ITC would certainly want to avoid a situation where it deems this patent valid and orders an import ban on its basis, but which could subsequently be deemed invalid in another Office action, and at some point a final Office action, which could be upheld by the USPTO's internal Patent Trial and Appeal Board (PTAB), and ultimately by the Federal Circuit. Every time that there would be bad news for the validity of this patent, such news would reflect unfavorably on the U.S. government in some people's eyes. I guess all of this explains why Apple couldn't simply elect to ignore Samsung's notice of the first Office action.